Iguanas are native to the jungles of the Caribbean and central and South America. Green iguanas are forest lizards who live high in the South American rainforest tree canopy. Young iguanas live lower in the canopies, while older adults reside higher up in the tree tops. Iguanas bask in the sun, with little need to visit the forest floor below other than when female iguanas lay their eggs. The green and brown scales of iguanas allow them to blend extremely effectively into the surrounding forest. Iguanas will remain extremely still, going unnoticed, until predators pass by. They often chose basking spots on tree limbs hanging over water so they can dive into the water to escape predators. Iguanas are excellent swimmers and go beneath the water surface to avoid predators. Iguanas have excellent sight able to detect movement from incredibly long distances to seek out prey and detect approaching predators. They use visual signals to communicate with each other through a series of rapid eye movements. They are considered omnivores, but most iguanas in the wild tend to eat an herbivorous diet. They feed on ripened fruit and leafy green plants. These large, docile lizards are often a popular choice as exotic “pets”. Green iguanas are some of the most frequently abandoned companion animals, likely because people find out too late what is required to care for them. A properly cared for iguana can live for more than 20 years and grow to be more than 6 feet long. 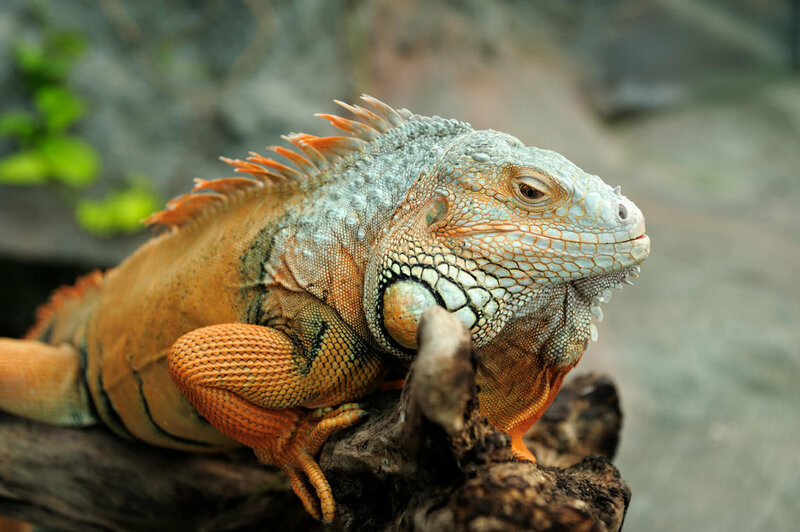 The enclosure for a full-grown iguana should be at least 18 feet long, humidified, and maintained at a particular temperature with specific timetables for darkness and ultraviolet light. Common problems for captive iguanas are metabolic bone disease from calcium deficiency, mouth rot, respiratory disease, abscesses, and ulcers. Wild iguanas do not suffer from any of these illnesses. They’re also strict vegans, limited to a very specific range of greens and fruits. Costs for food, an enclosure, lighting, and vet bills can total hundreds of dollars per year. It takes about a year of daily interaction to socialize an iguana, and even then, sexually mature males will be very aggressive six months out of the year if they see their own reflections or if confronted with other iguanas. There is a health risk associated with keeping any reptile. Seventy thousand people in the U.S. contract salmonellosis from direct or indirect contact with reptiles and amphibians every year. Children, pregnant women, and people with compromised immune systems are particularly at risk of serious illness or death. If you or anyone close to you is in one of these categories, rethink bringing a reptile into your home—even healthy looking animals may be carrying the disease. Many reptiles are brought into the country with little or no inspection or quarantine. Purchasing a reptile caught in his or her natural habitat encourages the removal of wildlife from delicate ecosystems. Buying captive-bred animals only encourages breeders to replenish their stock. If you must have a reptile as a companion animal, adopt from a local shelter or rescue group.